Employee engagement is a workplace approach designed to ensure that employees are committed to their organization’s goals and values, motivated to contribute to organizational success, and are able at the same time to enhance their own sense of well-being. There are differences between attitude, behavior and outcomes in terms of engagement. An employee might feel pride and loyalty (attitude); be a great advocate of their company to clients, or go the extra mile to finish a piece of work (behavior). Outcomes may include lower accident rates, higher productivity, fewer conflicts, more innovation, lower numbers leaving and reduced sickness rates. But we believe all three – attitudes, behaviors and outcomes – are part of the engagement story. There is a virtuous circle when the pre-conditions of engagement are met when these three aspects of engagement trigger and reinforce one another. But is employee engagement something new, or simply old wine (long-standing management approaches) in new (fashionable management-speak) bottles? Is it just the latest management fad? We believe that while it does have clear overlaps with analytical antecedents such as commitment, ‘organizational citizenship behavior’, job involvement and job satisfaction, there are also crucial differences. 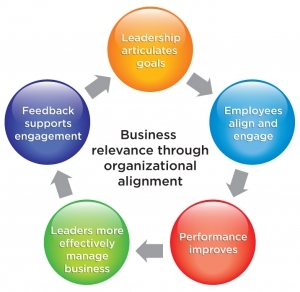 In particular, engagement is two way: organizations must work to engage the employee, who in turn has a choice about the level of engagement to offer the employer. Each reinforces the other. An engaged employee experiences a blend of job satisfaction, organizational commitment, job involvement and feelings of empowerment. It is a concept that is greater than the sum of its parts.